Have you heard? LIFE BOOK 2015 registration opens on October 6! Organized by Tamara Laporte from Willowing Arts, she is joined by 25 incredible art teachers who are all gearing up to share their mixed media techniques, tips and tricks with YOU! Themed around self-development and healing, you’ll be creating several loose mixed media art journal pages per month which by the end of the year you will bind into a glorious journal (a Life Book)! You will have a wonderful keepsake that you can treasure for the rest of your life! I am excited to announce that I will be teaching with Life Book 2015! Want to know more? Check out all the details HERE! Remember, registration opens on October 6 and the fun begins in 2015. I hope to see you there! Would you like a chance to win a spot in this amazing year-long workshop? Just leave a comment on this post by October 3 at 7:00PM and I will select a winner and announce by 10/3 @ 9:00PM. Here is the AMAZING line-up of teaching artists! Be sure to check out all the artists in the blog hop for more chances to win a spot in the workshop! 29th September 2014 - Roben-Marie Smith – YOU ARE HERE - THAT'S ME! Thanks to everyone who entered and left sweet comments. 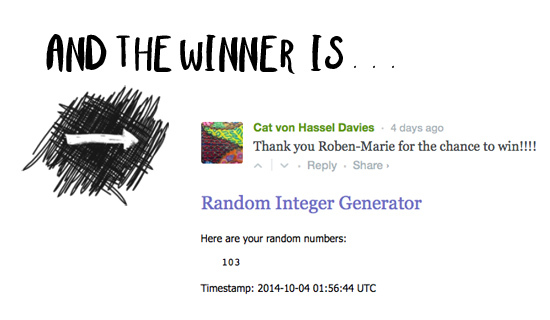 I used Random Generator to select the winner.